After six months of temporary digs, Skateistan’s growing South Africa chapter has broken ground on a permanent home and skatepark. David Webster Park, in Johannesburg’s Troyeville neighborhood, is named after a local anti-Apartheid activist who was assassinated by the Apartheid police in 1989. The area’s quality of life has only deteriorated in the decades since. Johannesburg has one of the world’s worst—and worsening—murder rates, and in Troyeville public drinking is common, car tires are often stolen, and rumors of muggings circulate almost nightly. 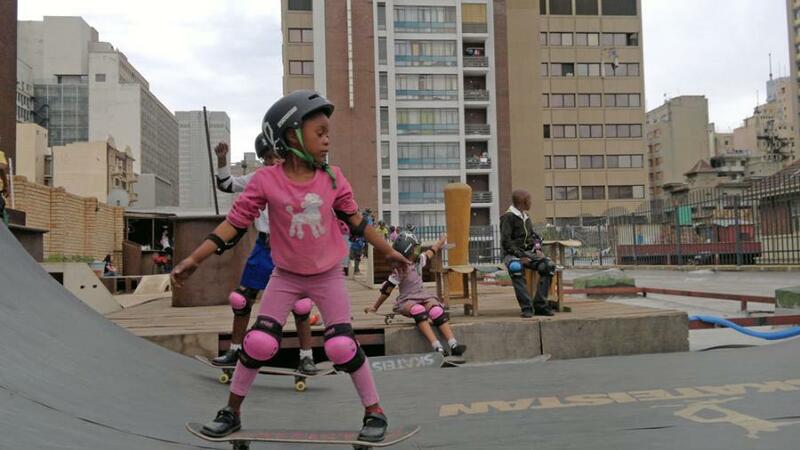 Yet as Kelly Murray, a Johannesburg native and one of the best professional female skaters on the continent, pulled up to the park, a throng of young girls crowded around the car. “Are you going to drop in today?” Murray asked one of the kids, a tall skinny girl with cornrows braided into two pigtails, who demurely ignores the question. She’s the class ripper, having first dropped in at the end of September. Murray is a sports coordinator for Skateistan, an organization founded in 2007 to provide a sanctuary to kids in war-torn Kabul through skating and classroom lessons. It has since expanded to Afghanistan’s fourth largest city, Mazar-e-Sharif, as well as to two cities in Cambodia. This past June, Johannesburg became the program’s fifth city. Skateistan South Africa broke ground at a permanent home in Joburg’s up-and-coming Maboneng Precinct last month. The facility will include a skatepark and classrooms constructed from shipping containers; it’s scheduled to open next April or May.